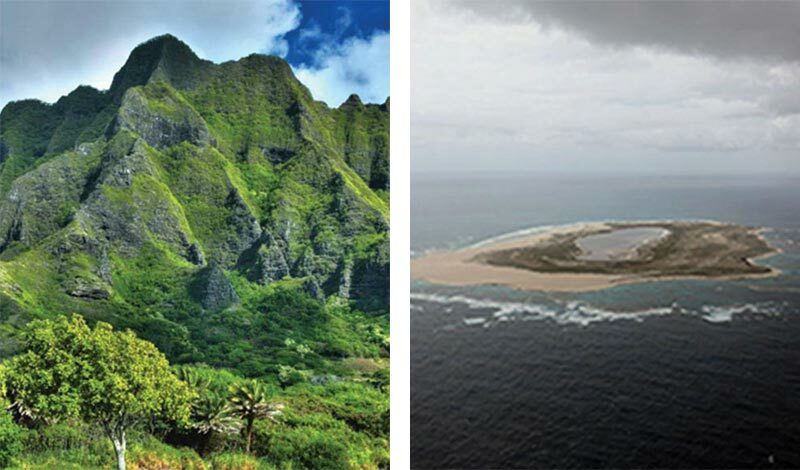 Explore how climate change is affecting Hawai‘i and the Pacific islands. The Pacific Islands include “high” volcanic islands, such as that on the left, that reach nearly 14,000 feet above sea level, and “low” atolls and islands, such as that on the right, that peak at just a few feet above present sea level. 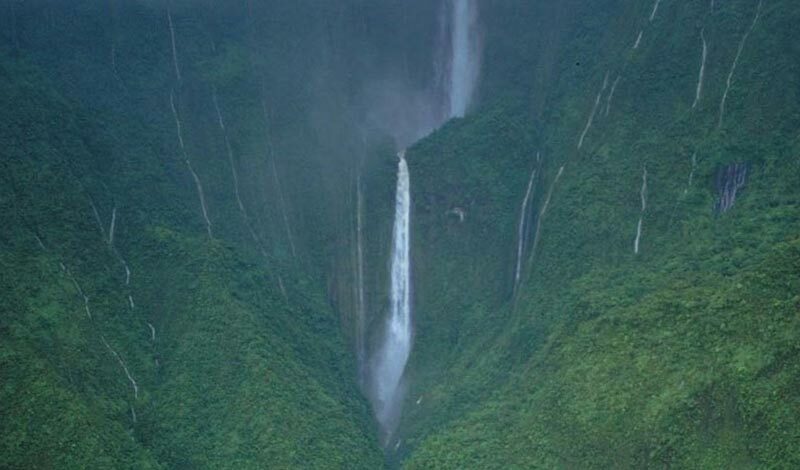 (Left) Ko‘olau Mountains on the windward side of Oahu, Hawai‘i. (Right) Laysan Island, Papahānaumokuākea Marine National Monument. The U.S. Pacific Islands are at risk from climate changes that will affect nearly every aspect of life. The region includes more than 2,000 islands spanning millions of square miles of ocean. Rising air and ocean temperatures, shifting rainfall patterns, changing frequencies and intensities of storms and drought, decreasing streamflows, rising sea levels, and changing ocean chemistry will threaten the sustainability of globally important and diverse ecosystems on land and in the oceans, as well as local communities, livelihoods, and cultures. 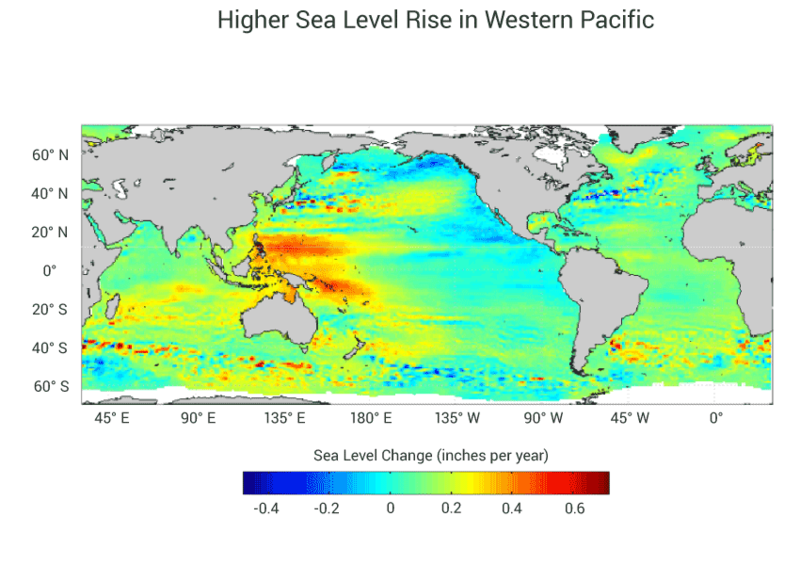 Rising sea levels will escalate the threat to coastal structures and property, groundwater reservoirs, harbor operations, airports, wastewater systems, shallow coral reefs, sea grass beds, intertidal flats and mangrove forests, and other social, economic, and natural resources. 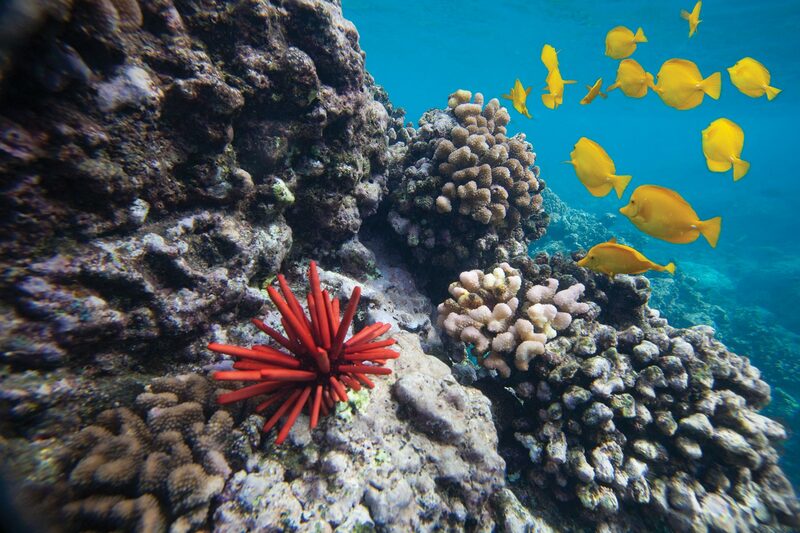 Increasing ocean temperature and acidity threaten coral reef ecosystems. By 2100, assuming ongoing increases in emissions of heat-trapping gases (A2 scenario), continued loss of coral reefs and the shelter they provide will result in extensive losses in numbers and species of reef fishes.2 For more on ocean impacts, see Report Finding 11: Oceans. Coastal infrastructure and agricultural activity on low islands will be affected as sea level rise decreases the land area available for farming,9 and periodic flooding increases the salinity of groundwater. Many of Hawai‘i’s native birds, marvels of evolution largely limited to high-elevation forests, are increasingly vulnerable as rising temperatures allow mosquitoes carrying diseases like avian malaria to thrive at higher elevations.11,12 Mangrove area in the region could decline 10% to 20% in this century due to sea level rise.13 This would reduce the nursery areas, feeding grounds, and habitat for fish, crustaceans, and other species, as well as shoreline protection and wave dampening, and water filtration provided by mangroves.14 Pacific seabirds that breed on low-lying atolls will lose large portions of their breeding populations15 as their habitat is increasingly and more extensively covered by seawater. Because Pacific Islands are almost entirely dependent upon imported food, fuel, and material, the vulnerability of ports and airports to extreme events, sea level rise, and increasing wave heights is of great concern. Climate change is also expected to have serious effects on human health, for example by increasing the incidence of dengue fever.17 In addition, sea level rise and flooding are expected to overwhelm sewer systems and threaten public sanitation. The traditional lifestyles and cultures of Indigenous communities in all Pacific Islands will be seriously affected by climate change. Drought threatens traditional food sources such as taro and breadfruit, and coral death from warming-induced bleaching will threaten subsistence fisheries in island communities.10 Climate change impacts, coupled with socioeconomic or political motivations, may be great enough to lead some people to relocate. Depending on the scale and distance of migration, a variety of challenges face migrants and the communities receiving them.